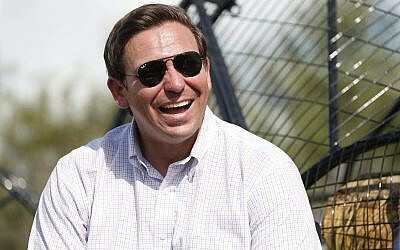 Florida’s newly elected governor, Ron DeSantis, long a pro-Israel stalwart in Congress, has said his first visit abroad in his new position will be to the Jewish state, days after winning a bitter election contest. DeSantis, a Republican and a Trump loyalist, told the Israel Hayom paperhe would also work against Israel boycott efforts in the state, and planned to strongly enforce existing legislation against BDS — pro-Palestinian the Boycott, Divestment and Sanctions movement. The governor-elect said he would like to boost cooperation between Israeli and Floridian universities and entrepreneurs, develop economic ties and enlist Israeli ingenuity to help solve certain challenges, such as harmful algae blooms along the state coast. DeSantis, who was one of the main proponents of relocating the US embassy in Israel to Jerusalem, and who has also called for recognition of Israeli sovereignty in the contested Golan Heights, said he would continue to push the matter with President Donald Trump. The Golan, he said, must remain in Israeli hands for strategic reasons. DeSantis on Tuesday defeated Tallahassee Mayor Andrew Gillum. DeSantis had trailed in almost every poll leading up to Election Day, but he parlayed Trump’s strong endorsements in the Republican primary and general election to pull off an upset. Asked whether he believed his positions on the Jewish state had helped him with Florida’s Jewish community, DeSantis said he did not know the numbers, but believed he had clearly shown himself throughout the race to be the pro-Israel candidate. In March 2017, DeSantis visited Israel on a one-representative Congressional mission to look into relocating the US embassy to Jerusalem. The governor-elect has said in the past that just as Washington’s relocation of its embassy would help take Jerusalem off the table in peace negotiations, American recognition of Israel’s sovereignty in the Golan Heights would clarify it has no intention of forcing Jerusalem to relinquish the territory, which it seized in the 1967 Six Day War, to Syria. He has said such action seemed to him a natural follow-up to the embassy’s relocation from Tel Aviv to Jerusalem, particularly in light of the ongoing civil war in Syria, and Iran’s attempts to entrench itself across the border from Israel. In May, DeSantis introduced a proposal for such recognition in the House, though it was blocked following reported opposition from party leaders and members of the administration. The White House denied involvement.